Many of you might be familiar with wines nicknamed “Super Tuscans,” high-quality but rule-breaking bottlings which originally had to be labeled as lowly vino da tavola. The great expense of these “table wines” made the dysfunction of Italian wine regulations all too clear, and they shamed the bureaucracy into action. In 1992, Italy created the new Indicazione Geografica Tipica category, or IGT, which alleviated the embarrassment and gave innovative winemakers a new home in which to experiment. And experiment they have. This inspired (if forced) act of deregulation paved the way for a host of exciting new wines produced up and down the boot of Italy, not just in Tuscany. I’ve written about several delicious IGT wines in the recent past, including examples from Soave, Maremma and Lazio. Now, thanks to a free sample provided by importer Winebow, I had the chance to try a “Super Veronese.” This wine offered yet more evidence of the great success of the IGT category. At first glance, the 2012 Zenato “Alanera” Rosso Veronese looks rather like an Amarone, the famous red blend made from partially dried grapes. Drying the grapes concentrates the sugars and chemically alters the grapes’ acids and the tannins, “something that explains the richness yet balance of a good Amarone,” according to The Oxford Companion to Wine. Botrytis, the fungus which beneficially desiccates grapes in Sauternes and Tokaj, is undesirable in this case. Only healthy grapes are used, and they are loosely packed in order to prevent fungal growth. As the Oxford Companion explains, “anything like botrytis that degrades the skins diminishes the intensity and purity of the wine,” because unlike a white Sauternes or a Tokaji wine, red Amarone depends on grape skins for color, flavor and tannins. The Alanera blend contains the three classic Amarone grapes, with 55% Corvina, 25% Rondinella and 10% Corvinone. Corvina, according to the Oxford Companion, has the capability to make “serious, barrel-aged reds,” as long as yields are low. “Particularly suited to drying” because of its “loose bunches and large berries,” Corvinone was long thought to be a clone of Corvina, but ampelographers showed it to be a different variety altogether. The black sheep of the blend, Rondinella is allowed in Amarone DOCG wines, but “its produce is rarely sufficiently flavorsome to please consumers,” the Oxford Companion argues. But Rondinella dries well, according to Wikipedia, and Wine Searcher notes that it adds roundness and herbal notes to Corvina-based blends. The Zenato Alanera differs quite dramatically from Amarone, however, in two important respects. It includes 5% Cabernet Sauvignon and 5% Merlot in the blend, and only half the grapes are dried for any length of time. 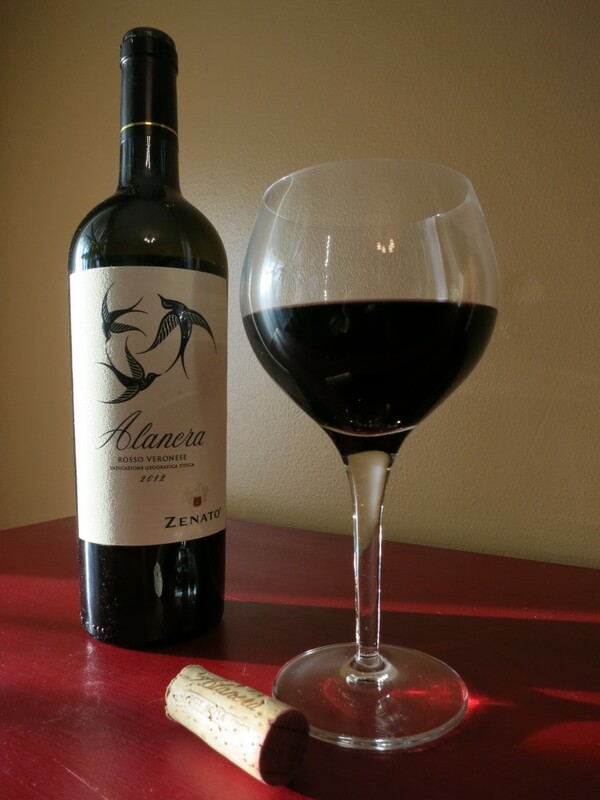 By not drying half the grapes, the Zenato Alanera would seem to combine the best of both worlds: concentration and intensity together with bright, fresh fruit. Or is it just Amarone lite? I opened the bottle last weekend to find out. The deep, almost opaque garnet color looked immediately enticing, and the aromas of dusky red fruit and earth were quite encouraging. The first sip revealed very taut red fruit, broadly generous acids and a raisiny, earthy finish, with a top note of something floral — roses perhaps. The Alanera was clearly well made, but it didn’t seduce me until about an hour later. By then, the fruit opened up and integrated beautifully with the rest of the wine. Some spicier notes came to the fore, particularly when paired with some rigatoni Bolognese. The wine felt big but controlled, with a focus that went above and beyond its $20 price tag. It’s a great value for the money. The Zenato Alanera may be innovative, but it builds on a centuries-old tradition. Veronese dried-grape wines “are the direct descendants of the Greek wines shipped by the Venetians in the Middle Ages,” The World Atlas of Wine explains. The Alanera represents the next generation in this storied lineage, and it is without question a worthy successor.